14,697 Miles * All Wheel Drive * 1 Owner/Carfax Certified * Full Factory Warranty * Easy Finance! 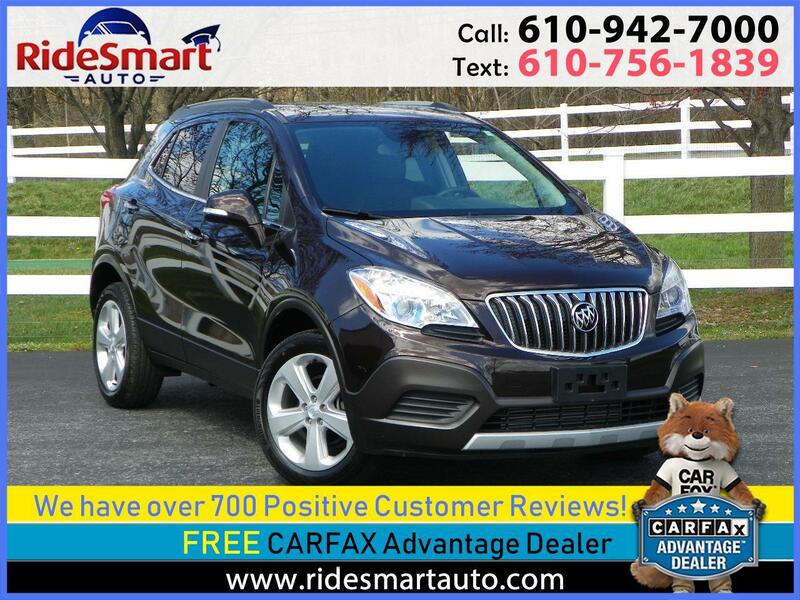 2015 Buick Encore Convenience 14,697 Miles * All Wheel Drive * 1 Owner/Carfax Certified * Transferable Factory Warranty * Nicely Equipped * Easy Expert Auto Financing in Minutes! Buick has broken new ground with its downsized Encore subcompact crossover. This 2015 Encore remains unique in both size and its quasi-luxury standard accoutrements. It features a turbocharged 4-cylinder powerplant, seats 5 and has 48.4 cubic feet of cargo area (with the rear seats folded).This city-size Encore also won’t disappoint in either features or ride comfort, and in its (sort of) pugnacious profile and outsized wheels, might even be mistaken for its larger Enclave cousin. This 2015 Encore features full-time all-wheel drive (AWD) to help get you through snow-laden avenues and slush-covered parking spaces. It also has GM’s new 4G LTE data-connection technology integrated into the standard OnStar system to allow the creation of a mobile WiFi hotspot & IntelliLink infotainment systemwhich uses a easy to use 7-inch color touchscreen. There also 18-inch painted alloy wheels, a roof rack, as well as heated power-adjustable mirrors and a beautifully executed exterior. Inside, there is vinyl/cloth upholstery, heated power-adjustable front seats and a fold-flat front passenger seat that’ll allow a few extra cubes of cargo carrying capability. Additional features include: Cruise control, telescoping tilt-wheel steering wheel, a rear-view camera, Bluetooth-integrated OnStar voice-activated directions-and-communications technology, with 4G LTE capability. Further techno-goodies endowing this Encore include IntelliLink infotainment system interfaced with the standard a single-CD player, 6 speakers and satellite radio. Standard safety equipment includes 4-wheel antilock brakes (ABS), traction and stability control, front and rear side-mounted and head-curtain airbags, daytime running lights, OnStar emergency communications and stolen vehicle tracking, a post-collision safety system and a remote antitheft alarm. Warranty Description: Balance of Full Factory Transferable To New Owner w/$0 Deductible.